FRAMINGHAM – Tuesday, October 10 was the last day for individuals to submit a resume to be considered for Framingham Police Chief. 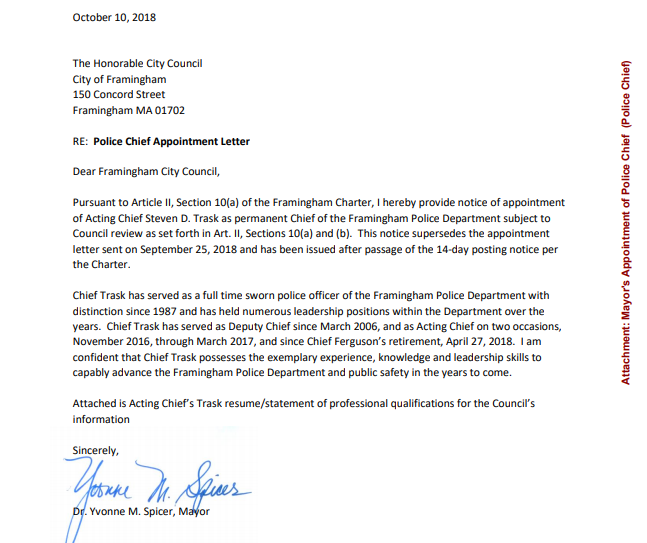 And that same day, Mayor Yvonne Spicer sent a letter to the Framingham City Council once again appointing acting Framingham Police Chief Steven Trask as her choice for permanent chief. On Tuesday, September 25 around 5 p.m., Mayor Spicer’s office issued a press release announcing her appointment of Acting Chief Trask as the City’s newest Police Chief. That night, according to the Framingham Police Unions, the City’s Human Resources Director Dolores Hamilton posted the City was seeking applicants for police chief on the bulletin board outside of the human resources offices in the Memorial Building. Both the patrolmen’s and the superior officers union have expressed its displeasure with the process and the selection of Trask. 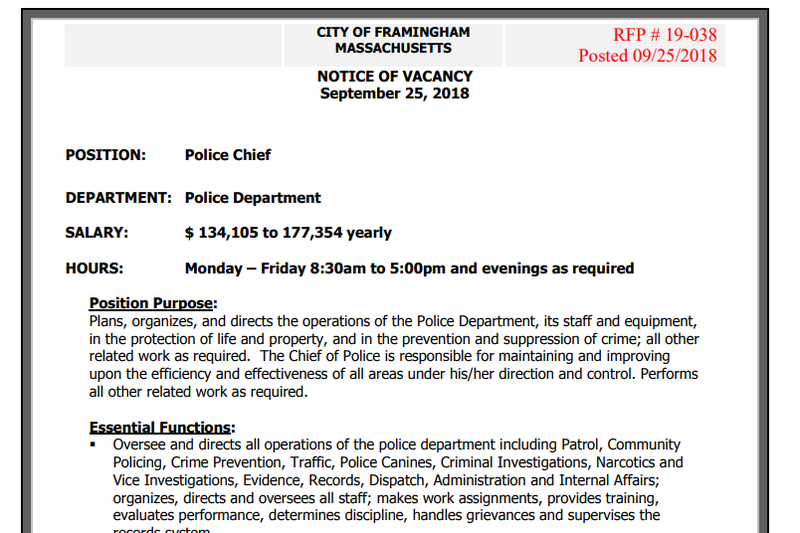 So hours after the Mayor appointed a new police chief, the City of Framingham began advertising for resumes for the police chief job, seeking not only internal candidates but external candidates. The position was posted with a salary range of $134,105 to $177,354 annually. The City Councilors questioned the timing of the announcement for Police Chief and the posting for applicants at its meeting earlier this month, at its October 2 meeting. At that meeting, Chief Operating Officer Thatcher Kezer described the job posting as a technicality, just to follow the law. The 11-member City Council has 30 days to endorse or reject the Mayor’s choice for Police Chief. A two-thirds vote is needed to reject. A majority vote is needed to approve. The Council has scheduled a special meeting to discuss the police chief, and take a vote on Tuesday, October 23. The meeting is scheduled to start at 7;30 p.m. There is a closed to the public meeting at 7 p.m. The rush on the vote is because Trask was appointed Acting Police Chief in April following the retirement of Ken Ferguson. The Mayor cited Trask’s experience as acting chief as her reason for his appointment. “Chief Trask has served as a full time sworn police officer of the Framingham Police Department with distinction since 1987 and has held numerous leadership positions within the Department over the years. Chief Trask has served as Deputy Chief since March 2006, and as Acting Chief on two occasions, November 2016, through March 2017, and since Chief Ferguson’s retirement, April 27, 2018. 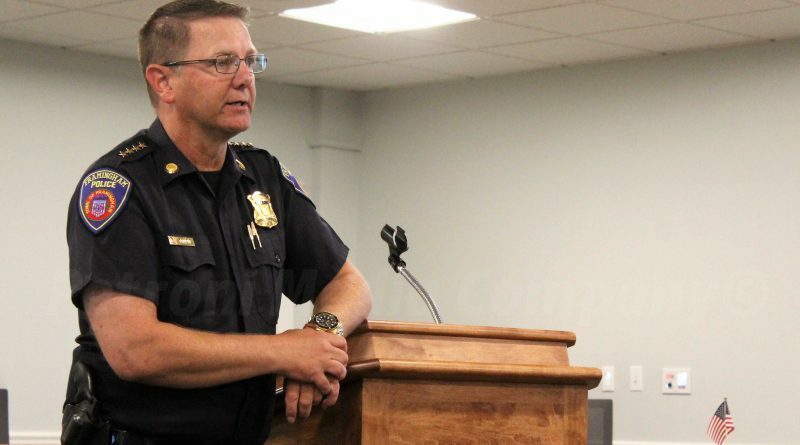 I am confident that Chief Trask possesses the exemplary experience, knowledge and leadership skills to capably advance the Framingham Police Department and public safety in the years to come,” she wrote to Council.